The traditional Gĩkũyũ stool was called the gĩturwa, (plural: iturwa) and was carved from a tree trunk as a whole piece without jointing. It was made by a professional wood carver known as mwai wa itĩ. The trees used for this work were mũringa, mũnunga, mũkũyũ, mũhũtĩ, mũrurĩ, mũthaitĩ and the mũkũi. One could buy the stool from the carver or if one had a tree already felled he could call the carver and they would share the stools from the tree. The blocks near the base would make the four legged iturwa of up to 16 inches in diameter and as the tree got thinner would be made into four legged smaller tũturwa as small as 5 inches diameter. The four legs were always preferred especially for the bigger ones. The seat was always a perfect circle and hollowed out slightly to accommodate a bum. It really is quite comfortable and much friendlier to the backbone than the modern sofa. It is comparable to using the eastern squatting toilet as opposed to the western seating toilet. Traditional squatting is most comfortable and apparently healthier. Women always used the four legged gĩturwa that was widest as the main seat in the kitchen, riko. This seat was never moved about and the woman would get very irritated with a daughter who moved it even a little. This seat was never moved outside when people sat outside the Nyũmba in outdoor cooking or other activities. The girls used the seats with the smaller diameter while the man of the house had a three legged special seat that was also not moved about. The rest of the children sat on the kweru side either on their haunches or on the ground and never used seats. These seats were never decorated or carved in any fancy design but were plain. They were polished with castor oil and they acquired a shiny mahogany look over time. Unused and extra stools were never left around the fireplace but stored in a corner, gaturwa-inĩ between the white place, kwerũ and the entrance space ruri. 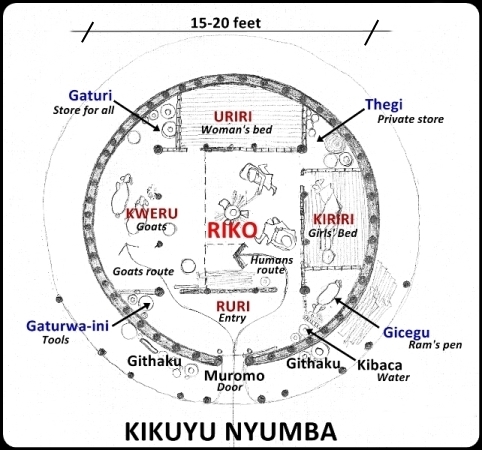 GIKUYU NYUMBA: Traditional Kikuyu woman’s house layout. Medicine men, and men of ruling council rank, kiama, also had special stools that they carried with them wherever they went. These special stools were small and light and carved very delicately. They were usually also decorated with chains around the legs and also had chain links arranged in patterns and hammered into the surface of the wood. I have been unable to get myself a living sample of this kind of seat to date but I am still searching. 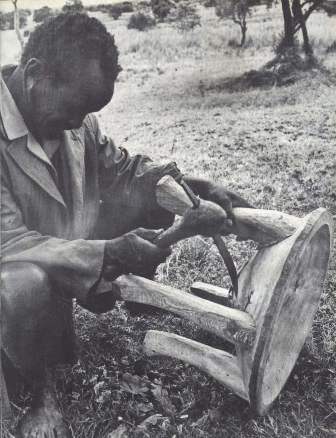 This man’s seat was what was called a njũng’ũa but the name was also used to refer to any man’s stool, three or four legged. A woman’s seat was the gĩturwa and was never stylized or decorated. The circle of the seat on the four legs imitated the circle of the Nyũmba with the square kitchen inside it. The infinite circumscribing the finite. Women usually get kittens for pets but mostly to control rats in the home. If the kitten is brought home for the first time it is said that it will retrace its steps back to where it was taken from however far. The myth is that if some milk is put in the hollow of the woman’s giturwa and the kitten made to drink from there, it will stay and never want to run away. MANA MAIKARĨIRE MANA – Four sitted on four is what they say.